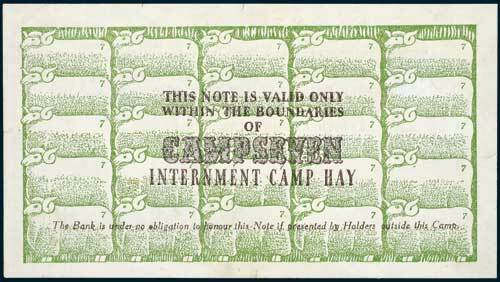 WORLD WAR II, The Camp Seven Bank, Internment Camp, Hay, Robinow/Stahl, one shilling, Hay, 1st March 1941, D 22872 (Campbell 1213c; S&B.552c; MVR p58; unlisted in Bulluss). Minor edge faults otherwise nearly extremely fine and rare. 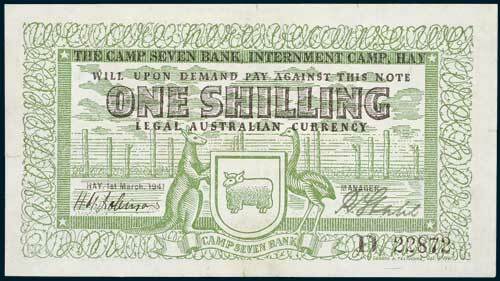 Ex Noble Numismatics Sale 51 (lot 3390).